As part of Crosswater’s annual eight-week sale, our brand and marketing team developed an eye-catching creative campaign that focused on increasing brand awareness in store and in the media as well as increasing the brand’s online visibility. From promotional material to a newly produced dedicated website, each element of the integrated campaign worked together to drive traffic to both the sale website and into showrooms. Bringing a touch of fun and personality to the campaign, Fred the Flamingo was created as the sale mascot. Featuring throughout all promotional material, Fred added a dynamic and interactive element, helping to increase awareness and recognition of the Crosswater sale. Using new lifestyle photography, the team designed eye-catching and trend-led point of sale material that was displayed throughout Crosswater’s extensive retailer network. From high-circulating national weekend supplements to key consumer magazines, a far-reaching full page advertising campaign was booked in the lead up to and during the sale period. Helping to drive traffic to the sale website and support SEO, an online advertising campaign was carried out across a number of home interest websites. A tailored social media advertising campaign was also carried out across Crosswater’s platforms throughout the sale period. 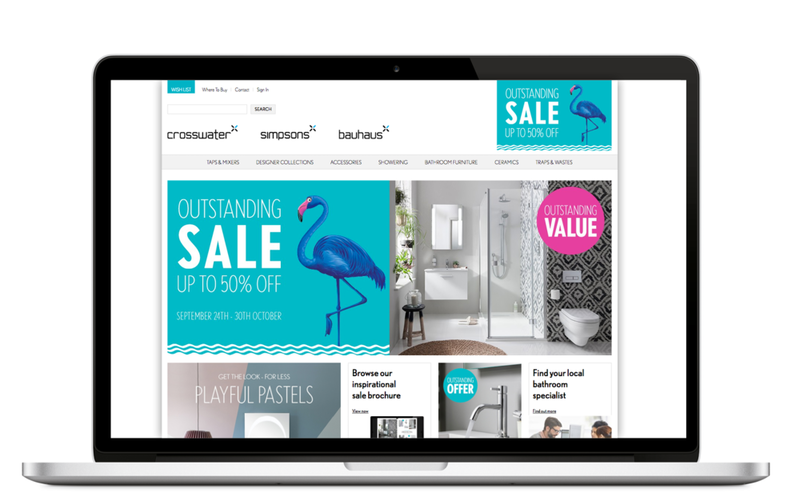 A fully responsive dedicated sale website featuring inspirational content and details on the extensive products that were on offer was produced. The easy to navigate site provided all the information needed on the sale for both consumers and retailers. From animated GIFS to digital graphics, our creative team increased Crosswater’s online visibility through eye-catching content production. Working in conjunction with the digital and social media campaigns, this specially developed content helped to increase online brand awareness and engagement. Using new trend-led lifestyle photography, the team designed and produced an inspirational consumer brochure for the sale. Distributed to Crosswater’s retailer network, the brochures provided customers with a complete overview of all products on offer.